Friends, family, stalkers,B spambotsB and people who clicked on to my blog by mistake. B I’m going to ask you for a favor. B I am sharing with you this incredibly embarrassing video where I look like I haven’t slept or brushed my hair in months (It really happened to rain that day). In exchange please vote for me every 24 hours on all your computers =) That’s right I somehow entered myself in the team refuel athlete of the month sponsorship. Either way, they limit how many times I can voteB forB myself per day. B So I’m going to pimp myself like crazy. B If I win, I’m hoping I can use the $$$ for Philly Marathon. B I think in all my leg/knee whining, I forgot to mention that after some reviewing my Non-NYC MarathonB options, I picked Philly. B Did I mention it’s on my birthday (I know I’m a broken record)? B What better way to help me celebrate my 26 years then by voting for me so I can run those 26.2 miles on that special day. Tony is just shaking his head at me (and voting of course, right Tony?). B I don’t think he approves me signing up for these races while my body is doing a less than silent protest. B Good thing he has other uses. B Like making Sunday dinner. MnnB fried cheese rice balls. B Good thing he prefers carbs over theB paleoB diet; otherwise there might have been some dining problems. B Couples who eat carbs together, stay together. In other Monday news. B I’m trying to taper this week and leave some juice in my legs for the half on Saturday. B I B ellipticaledB 10.5 miler while watching “Once Upon A Time.” I thinkB that’sB my new favorite show. B Dear ABC please don’t cancel this show like you tend to do with all theB quirkyB shows I like. 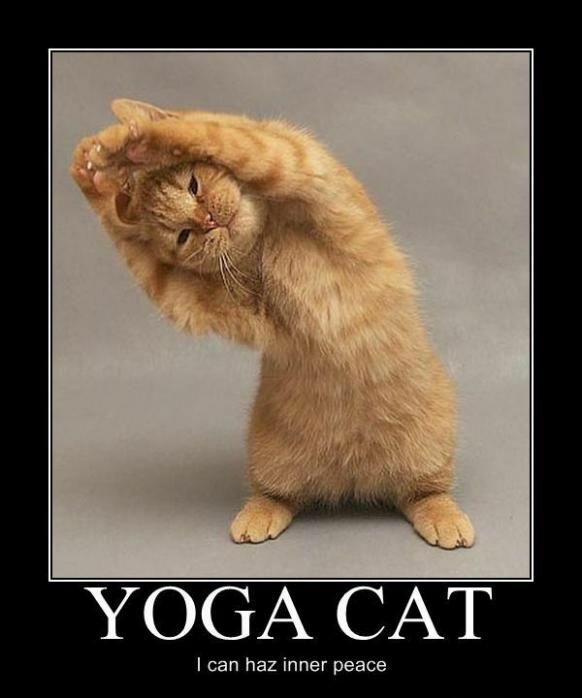 I also did a Yoga class at the YMCA today. B It might not smell as good as the fancy Yoga studio but the price andB convenienceB really can’t be beat. B As gross as it sounds, I like that they have mats already so I don’t break my back carrying my Matt to the train (1 mile) and then back from the train (1 mile). B The best part about it was that at a 6PM class there was only 7 people in the class. B I think this creates a much more relaxingB environmentB then when I feel like someone’s Warrior 2 is going toB whackB my face. B It was a mix of styles but I really like how our instructor explained each move slowly. B I guess if I was a more experienced talented yogi I would get annoyed but for my level it was perfect. 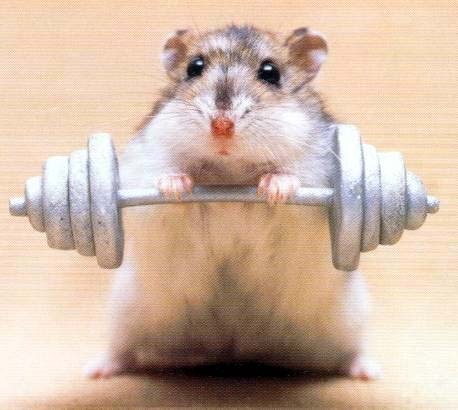 Yup, I signed up for the YMCA. B I also ordered aB swim-cap. B I’m hoping that I can learn how to swim on my own. B Once I can swim beyond 10 inches maybe I’ll get over my fear of biking for speed and try a triathlon. Danskin Triathlon looks like a good one to start with. B It’s all women, so I don’t have to worry about getting run over by aB testosteroneB beast. B You know, the kind that run 5Ks in a rage while knocking over 5 feet tall girls (maybe this only happens to me). B I can only imagine what they do on Bikes. B Anyways, another cool thing about the Danskin Tri is their swim angels that help guide those who can’t swim. B I think the July date is too soon for me but I’ll definitely try to keep this on my radar for 2013. B Right now I just want to learn how to not drown. B I should probably also look into buy a speedo one piece suit. Anyone else trying anything new this summer? Do you know how to swim? B I was a NYC kid who only saw water when it came out of the faucet. B Swimming is about as foreign as driving is to me. B Both things I’m going to try to learn over this summer. I must confess, when I see people running, I secretly race them.B I don’t know why, its my inner competitive child that never got out when I was younger since I didn’t partake in any sports until I was 24.B Sometimes I win, sometimes I lose.B Combine this secret racing with a self-imposed marathon and you get one sore Liana the next day. When I got to the gym for my lunch break, I mentally wanted to run but I knew although I felt energetic that the knots of soreness in my right upper leg might beg to differ.B With less then 11 days before my marathon I decided there’s no need to argue with the legs.B So 4.2 miles on the elliptical with some arm weights and a ton of foam rolling became the new plan. After work I made an urgent date in my outlook calender for a Bikram session where I reached a new level of sweat.B I had so much sweat dripping, pouring that I kept sliding all over my mat even with two towels covering it! And as ridiculous as I looked (and let me tell you I take quite the award for lack of balance) the hips and legs felt looser.B I also didn’t die from drowning in my own sweat, although I was pretty close to it.B Maybe the soreness will leave the body tonight. Also, can I mention how awesome Thai food is.B Can I also mention how much more awesome Thai food is after a 26 mile run. I think if calories were no issue and I had a personal chef, I would live of drunken noodles! Whats your favorite type of food? Do you ever race random strangers on your runs? And I did 25 minutes of elliptical in between weights, 12.5min to warm up, 12.5min in between my final weight set. 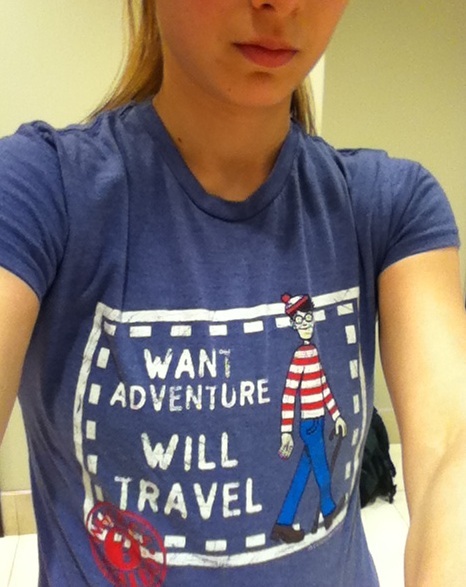 And all while wearing my super-cute Waldo T-Shirt.B Is anyone really too old to buy silly low quality $5 t-shirts? After work I went to my semi annual Bikram Yoga. Bikram is usually done in a room that is heated at a minimum 105F degrees and about 40% humidity.